If you want to run into pro surfers at night and eat some of the best Thai food of your life, luckily there is actually such a place that exists. 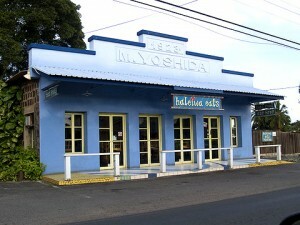 It’s Haleiwa Eats in Haleiwa on the island of Oahu. Haleiwa is the place to go for dinner when you are staying on the North Shore, and Haleiwa Eats is every local’s favorite. You may love Thai food, but if it isn’t your favorite, don’t give up on trying it out. A few years ago when I was just visiting the island for a week with my family we were told that we had to eat at “Eats”, as it is known here. I think each one of us had a complaint or two about eating Thai food, but we listened to our friends and its now a family favorite. Another cool part though is that you almost always will run into all the biggest names in surfing, especially during contest season. I try to eat there a few times a month and without fail almost every single time I get to eat right next to my favorite surfers, both local and visiting. Don’t think that I am some weirdo that gets star struck by seeing famous surfers; I’m really there for the food. It’s incredible. One thing you have to try is the coconut rice. It doesn’t matter what you order for your main course, coconut rice on the side is a must. If its your first time there, you now know you are going to get the coconut rice, and here are some of the most popular dishes to go with it: Panang Curry, Bangkok Night Noodles, Yellow Curry Noodles, Pad Thai, Cashew Chicken, Monsoon Shrimp, Pineapple Curry Shrimp and The Gulf of Thailand. Literally everything there is amazing. Every time I venture off of my usual picks and try something new I am thoroughly impressed. It doesn’t matter if you are choosing soups, noodles, meats, or seafood; the chefs at Haleiwa Eats know what they are doing. Check out their takeout menu right here, and don’t forget the fried coconut ice cream or fried bananas for dessert! I’ve got to admit that there is one thing I hate about Eats. It is expensive, and the prices are always going up. I used to be able to eat for around $10 a few years ago, and now when you include tip it usually comes out to around $15 to $20. That is just for a simple meal, I’m being cheap and not getting drinks or desserts, so it can add up quick. I also think that sometimes the service is kind of slow. It never can annoy me too much though because the food is so good. Another thing you should know is that Haleiwa Eats does not serve alcohol, but they do allow you to bring your own. If you are planning a surf trip to Hawaii, plan on stopping at Haleiwa Eats. It will most likely be the best place you pick for dinner throughout your trip. It’s easy to spot on the main road through Haleiwa, close to Matsumoto’s Shaved Ice, which is another spot you must hit, which we will be sure to write about later on. 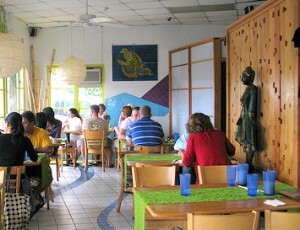 Eats is a tiny place with a small dining area and a couple of outside tables, but guaranteed to be drawing a crowd. Don’t worry; the waits are never too long.